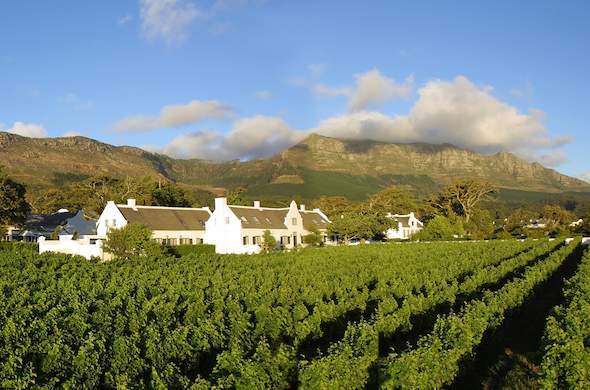 Steenberg Hotel is a 5-star Cape Winelands hotel ideally situated in the heart of the Constantia Winelands. Situated on the oldest wine farm in the Constantia Valley, Steenberg Wine Estate welcomes guests to a luxurious Cape Town getaway. This Cape Winelands hotel is a national monument with the original manor house dating back as far as 1682. Stay in luxury in a choice of beautiful air-conditioned rooms and suites that feature state-of-the-art facilities. This Cape Winelands lodge boasts a range of different room options to choose from. Accommodation ranges from elegant rooms to luxurious and spacious suites reflecting the Cape's heritage. Enjoy views over the scenic Steenberg Mountains, golf course and False Bay. Afternoons at Steenberg Wine Estate revolve around game of golf at the 18 hole Steenberg Golf Course, soothing massage and other optional treatments at the spa, and sipping sumptuous wines at the various tasting areas on the estate. Feast on mouthwatering, contemporary South African cuisine at the award-winning Catharina's Restaurant or BistroSixteen82 for the ultimate dining experience.